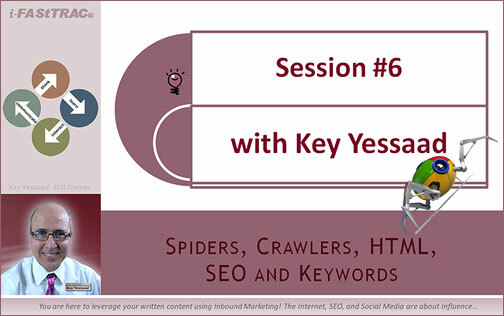 SEO Training Session 6 - What do Web Spiders feed on? In today’s session 6 of i-FAStTRAC Real Estate Training I will focus on Spiders, also known as Web Crawlers, Indexers, and sometimes Bots. These little critters are released by Search Engines to feed on web information, index it, and then run it through the Search Algorithm that generates the Search Results Rankings. So what do these fuzzy lovable critters feed on? Does your Real Estate Website offer the right nourishment? but more importantly – what can you, The Real Estate Agent, do about it as the person in charge of Marketing and Prospecting? Internet Marketing does not belong to programmers, it must become a natural part of what agents offer their customers in a thoughtful practical manner. The first step is removing the cloud of non-sense that sometimes is wrapped around SEO, and get the heart of the matter of Internet Marketing – from there must come good habits and methodical implementation.